In 1839, the slave ship La Amistad was taken over in a slave revolt led by Mende captives. This led to a drawn out trial involving many different parties concerning murder charges and property rights, while abolitionists of the time used the trial to prove that these Africans had rights the same as anybody else. While this incident didn’t change the times it did have lasting effects whose ripples could be felt throughout that time in history. It remained a story that seemed overshadowed by other historical events until Steven Spielberg, producer Debbie Allen, and writer David Franzoni resurrected the story for modern audiences. While it isn’t the most historically accurate film in the world, it has a sense of courage and honor that shows there was plenty of good in a time of evil. After freeing himself from his chains securing him to the slave ship La Amistad, Mende captive Sengbe (Djimon Honsou) leads a revolt against the Spanish slave traders on the ship. Due to their lack of knowing how to properly navigate a ship, Sengbe and the rest of the Africans find themselves landing in an American port and are swiftly arrested by Naval officers. The captives are once again locked in jail where they await trial for murder and cases involving property rights. This attracts the attention of abolitionist Theodore Joadson (Morgan Freeman) who enlists the help of property lawyer Roger Sherman Baldwin (Matthew McConaughey) to represent the captives in a court of law. 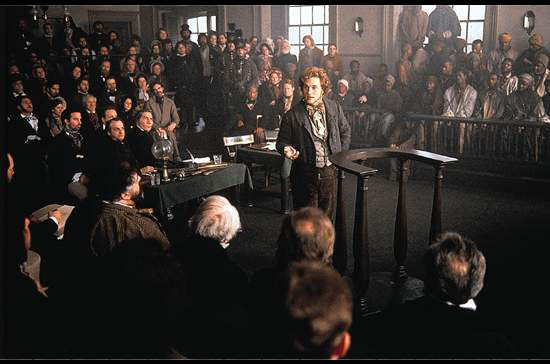 The proceedings actually keep favoring Baldwin’s arguments, but it doesn’t take long for President Martin Van Buren (Nigel Hawthorne) to intercede and take the matters to the Supreme Court. With their case quickly spiraling out of control, Joadson, Baldwin, and Sengbe recruit the help of former president John Quincy Adams (Anthony Hopkins) to stand up for the Africans’ rights in the highest court of the land. Amistad is the first film Spielberg made with Dreamworks, and at this point it’s hard to believe there was a time that he wasn’t working with this company. This was the time when Spielberg was really showing what he had to offer. This is epic film making that only got better with Saving Private Ryan. The production design of this movie is top of the line with sets that seem to live and breathe. I am really interested in this time period, so I may be a little bit biased to praise movies that so completely bring this era to life. While the set design and costumes already stand tall, there are other factors that exist to completely draw you into the world of this movie. The first is John Williams’ beautiful and often sweeping score. The other is Janusz Kamiński’s eye catching cinematography that was also put on display with Spielberg’s previous movie, Schindler’s List. Like I said earlier, Amistad is an epic movie that really takes its time in telling the story and making sure all of the information is clear to the audience. This is both a good and a bad thing. While there is plenty of dramatic momentum moving the story forward, it’s hard to ignore that this can be an overly wordy movie. There are some moments where you have to stop and think of people really talk like the characters in this movie do. The writing is mostly spot on, but there are times when it becomes a little bit too theatrical when a general rule for film making is to show the audience information and not outright tell them. There’s one scene in particular that really stands out. There’s a scene where John Quincy Adams is addressing the Supreme Court, and it’s clear that Spielberg was really into shooting this scene, and for a while it’s incredible. It’s an amazing speech that unfortunately never seems to end. There were at least three different times where I thought that the speech was over, but then the camera would change and Hopkins would continue on. It became almost comical. While this movie does get a little wordy and bogged down in over the top dramatic soliloquies, the people delivering these lines are all megastars in their own rights. This is a great cast with Freeman, McConaughey, Honsou, and Hopkins all knocking it out of the park. McConaughey and Honsou especially work great together and their getting to learn to understand each other while not speaking the same language is my favorite part of the whole movie. I do feel like Morgan Freeman was underutilized and only has a few memorable scenes where I feel like he was actually given something to do. Finally, Hopkins isn’t in the movie all that much, but when he is it feels like I’m watching the real John Quincy Adams and not an actor playing the part. Few actors can pull that off as well as Hopkins can. 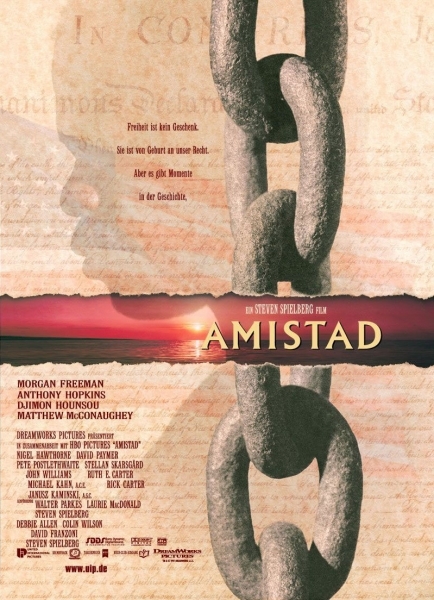 Amistad has all the working of a memorable and epic Steven Spielberg movie. It’s filled with a cast of great actors, excellent music, and fantastic production design. It also is a little bit overdone in some parts, which can either add more of an entertainment quality or come off as something a little less respectable. This isn’t Spielberg’s finest achievement, but it is one that I feel doesn’t get the respect that it deserves. Personally, I thought it was a great movie and it’s one that I’d love to watch again. It tells an excellent story, and while it may not be totally historically accurate, it’s a pretty epic way to spend an afternoon. Since it’s foundation, animation company Laika has been behind some of the best animated movies in recent years. Their first three films, Coraline, ParaNorman, and The Boxtrolls, all have very unique stories and designs while also taking an alternative route to how family movies are made and the themes involved. 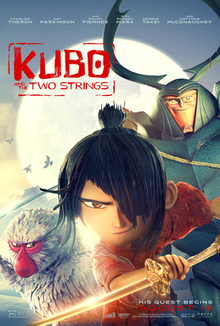 Their latest movie, Kubo and the Two Strings, fits in very well with the rest of their filmography in that it tackles heavy subject matter and also isn’t the kind of happy go lucky animated movie you can expect from companies like DreamWorks. While it is a very alternative kind of family movie, it’s still a beautiful looking movie with great characters and is full of adventure which is what makes fantasy movies like this all about. Kubo (Art Parkinson) is a boy growing up secluded from most of civilization in medieval Japan. He provides for his sickly mother by going down from the mountain where he lives and performs shows with his magical origami paper and playing his shamisen. One night, after being in the town after dark, his evil aunts (both voiced by Rooney Mara) find him and attempt to bring him back to his evil grandfather, Raiden, the Moon King (Ralph Fiennes). Now on the run, Kubo meets his guardian, a monkey aptly named Monkey (Charlize Theron), who is tough as nails and will do anything to protect the boy. They soon meet Beetle (Matthew McConaughey), a man cursed to live in the body of a beetle. Together, Monkey and Beetle aid Kubo on his quest to find the missing armor and sword of his deceased samurai father, which are the only means of defeating the Moon King and securing a safe future. What really drew me into this movie was the beautiful stop motion animation, which is my absolute favorite form of the art. There something about the otherworldly, yet fluid movement of stop motion that makes it perfect for a fantasy film like this. After seeing Kubo and the Two Strings and reading a little bit about its production, I feel like it’s an absolute miracle it even exists. The patience required to make a feature length stop motion film is far greater than I can even perceive. 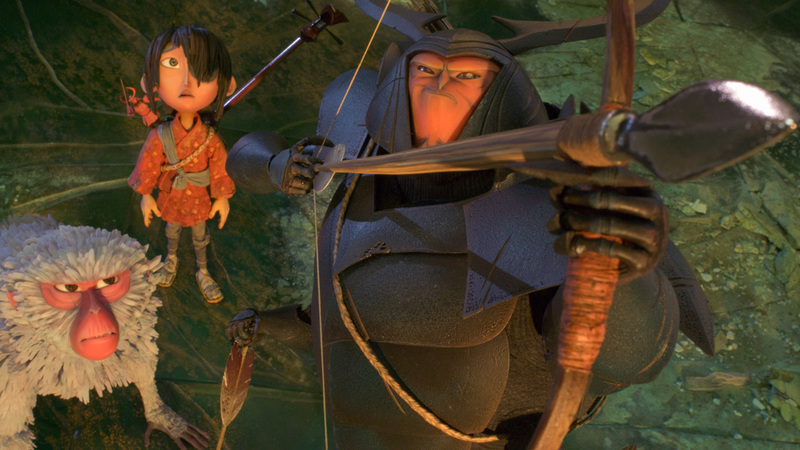 Kubo and the Two Strings was painstakingly filmed over five years. That’s unbelievable to me, especially someone who doesn’t know the first thing about animating. The result is a beautiful world full of color and darkness, movement and breathtaking stillness. It lives and breathes in its own unique way, and is some of the best animation I’ve seen in a long time. While this is a gorgeous movie to look at, the story sometimes faltered for me. The main quest of Kubo and his companions traveling to find the lost armor of Kubo’s father is all well and good, and I was intrigued with it for the most part. My only problem is that the real threat doesn’t make itself known until near the end, and instead it is only talked about. I didn’t need Kubo to confront his enemy, the Moon King, right away, but it would’ve been good if he had more of a presence. On the flip side, Kubo’s ghostly aunts had some really cool scenes, and were probably my favorite part of the movie. If I’m talking about the story, I have to talk about the end. Without spoiling it, the end left me scratching my head. I’ve tried really hard to figure it all out, and I’m pretty sure I did, but I can’t say that my knowing what they were trying to do made the ending better. It all just kind of comes from left field without any warning. While the story does have its flaws, there’s this mood that pervades throughout the entire movie that really hits you in the feels. For being a family movie, this is a very mature film that deals with mature themes and scenarios. In my opinion, there should be more families like this that don’t rely on cuteness and bright scenery to make a successful film for kids. I feel something like Kubo and the Two Strings is the movie that will provide the younger folk more about the truths of life. There’s a light side to Kubo and the Two Strings, but there’s also this pitch black darkness that sticks with the viewer all the way to the end credits. To put it in the simplest of terms, this is very mature family movie that is full of things for both adults and children to think on. Kubo and the Two Strings is not a perfect movie, in fact I kind of wanted to like it a little more than I did, but it’s still a very strong and intelligent movie. The animation is out of this world and the content can get a lot heavier and more mature than you might expect. The only problem I can think of is a story that grew a little weak over time and a villain that didn’t make himself known nearly enough. Still, this is a movie that’s good for families of all ages to see. Who doesn’t love a good fantasy adventure? In 1996, the small town of Carthage, Texas experienced the most bizarre act of violence it has ever seen perpetrated by the least likely of suspects. This strange, almost surreal tale, caught the attention of a journalist named Skip Hollandsworth, and his article on the event caught the attention of film making auteur Richard Linklater. After the two put their minds together, the end result of their collaboration was the 2011 dark comedy Bernie. Murder may seem like a really heavy subject to make a joke out of, but in the hands of Linklater it has the ability to be both funny and upsetting, which makes Bernie an odd, but lovable dark comedy. It would be a strange thing if the most popular and loved man in town was the assistant mortician, but that is the case of Bernie Tiede (Jack Black). In the small town of Carthage, Texas, Bernie serves the community in the ways he knows best: making the deceased look their best for their funeral and comforting the the grieving family in the days and weeks that follow. Normally it all works out fine, but Bernie gets in a little over his head when he gets involved with Marjorie Nugent (Shirley MacLaine), the meanest woman in Carthage who recently lost her wealthy husband. While Bernie does become good friends with her, their relationship deteriorates over the course of a few years which pushes Bernie to do something unthinkable and completely out of character. As questions start rising about Nugent’s sudden disappearance, District Attorney Danny Buck Davidson (Matthew McConaughey) starts building a solid case for murder. Bernie works really well on a few different levels. For one thing, you have some surprisingly fantastic performances, but then you also have a really unique true crime story that works because of how funny the screenplay is and how interesting the questions is raises are. It’s quite clear that Bernie Tiede did something egregiously wrong and deserves to be punished, but I found myself siding with the people of the town when they were lobbying to make his sentence a lot less harsh than it should have been. It made me wonder about the adage that the punishment should fit the crime. Can there be circumstances where that shouldn’t be as strongly applied? I don’t want to analyze this movie too much because it doesn’t really need to be, but it was nice to see that there was more to it than just a dark comedy. It had a point of view that could rouse up debate, which is a good thing when working in this genre. Going into Bernie, I was expecting it to be pretty straightforward when it comes to structure, but this is actually a very strange example of how to make a movie. Leave it to a film maker like Richard Linklater to take what could’ve been a pretty average movie and work it into something different. What makes this movie really unique is that there are interviews throughout the length of the film with some of the real residents of Carthage who personally knew Bernie Tiede. There are some interviews that are scripted, but a majority of them are spoken by people that experienced the events first hand. This makes the movie feel very authentic, but also something like a legend to come out of this small Texas town, where word of mouth sometimes distorts the truth but gives you a taste of the town’s lifestyle. It’s also really funny to see scenes play out that are exactly what one of the interviewees were just talking about. At first, I was a little put off by this, but I’ve grown to really love the originality behind it. Other than his part in his band, Tenacious D, I feel like Jack Black’s film career really took off when he starred in another of Linklater’s movies, School of Rock from 2003. Black gives a funny and pretty standard performance in that film, but he really gets to show off his acting chops in Bernie with a performance that may be the only reason you need to see this movie. Sure, I highly recommend the film anyway, but I find that it’s almost necessary for people to see it because of Black. Bernie is a character that is far from what the actor is used to playing, but he seems to pull it off with ease and it’s easy to forget that you’re watching an actor and not the actual Bernie Tiede. Bernie had a lot of potential to be a run of the mill dark comedy, but under the direction Richard Linklater, it became something a little more. With films like Dazed and Confused and Boyhood under his belt, it’s quite obvious that Bernie doesn’t rank up at the top of Linklater’s filmography but it does rank the highest for Jack Black. This is an interesting movie in terms of content and structure, but it will also make you laugh and want to stick around for the end. I’d say check this one out. One of the things I’d love to do with my life is to be able to teach film, wether it’s film history, writing, or anything really. That being said, there are times where I watch a movie and I think, “That’s one that I would teach.” This is where Jeff Nichols’ film Mud comes in. Without a great screenplay, there’s no way for a movie to achieve true greatness, but when I say the screenplay for this movie is the best I’ve seen in a long time, I would not be exaggerating. It may be a slow moving story, but it is full of mystery, true to life characters, and a strong sense of pacing. Ellis (Tye Sheridan) and Neckbone (Jacob Lofland) are two 14 year old boys growing up in De Witt, Arkansas. 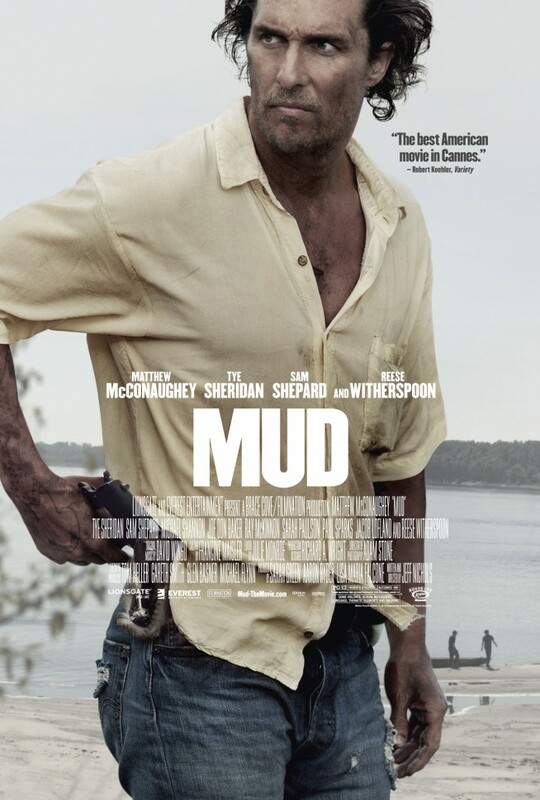 One day while investigating a boat stuck on the branches of a tree on an island on the Arkansas River, they meet a man named Mud (Matthew McConaughey) who is apparently using the boat and the island as a hide out. According to Mud, he is waiting there for his girlfriend, Juniper (Reese Witherspoon), to meet him there and start the rest of their lives together. The two boys become so enraptured by Mud’s tale of love and adventure that they start bringing him food and helping him get the boat down from the tree to get away on, but little do they know the danger that lurks from Mud’s past and the trouble that their curiosity might get them into. When I say the screenplay for Mud is some of the best writing I’ve ever seen, I don’t think I’d be kidding you or myself.Everything that is said or done over the course of the movie is important in some way. Not only that, but this movie works great as both a coming of age drama and a suspenseful work of mystery. The mystery begins right away when the boys find a boat in a tree, which is a really intriguing plot device. to begin with. Thing get even more complex and interesting when they meet Mud and he begins telling them what his life has been like and why he’s hiding out like he is. The thing is, Mud can’t really be trusted and the fact that we’re seeing all this through the eyes of a fourteen year old boy makes it more questionable. Having this movie’s story told from the perspective of a fourteen year old is a very important element to the plot. When you’re fourteen, the world seems huge, but you’re ready to face it head on. I know that when I was fourteen, I would hear something and believe it no matter what anyone else told me. This makes the character of Ellis so complex, because he can be so easily molded by what’s around him. This also makes his interactions with Mud more intriguing and mysterious, because even I didn’t know what to make of Mud or how much to believe him. I feel like I’m ranting now. What I’m trying to say is that Mud is a super deep film with themes that span from adulthood to love and to truth, just to name a few. This was shot during McConaughey’s big comeback. 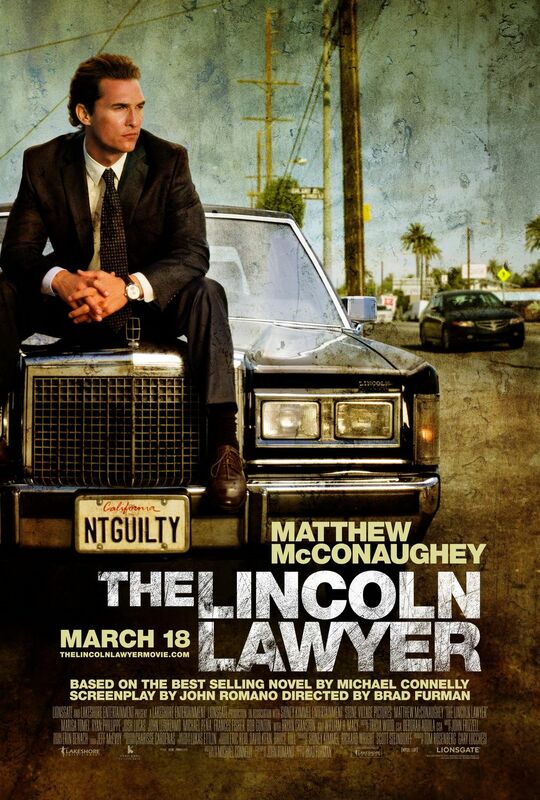 Before this there was Killer Joe and The Lincoln Lawyer, then there was Mud and finally Dallas Buyer’s Club for which he won the Academy Award. 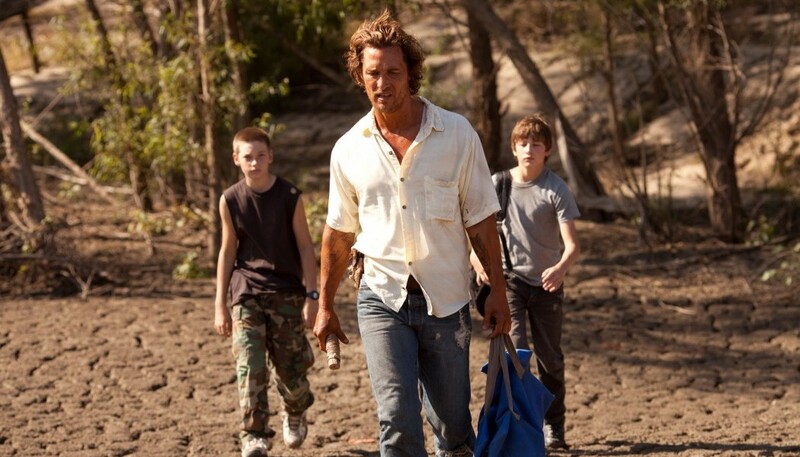 Needless to say, McConaughey gives a fantastic performance as Mud, who is both likable and, in a way, reprehensible. Even the kids give good performances. Tye Sheridan and Jacob Lofland have great chemistry and seem to have a great understanding of their characters. The only person I feel was underutilized was Reese Witherspoon. The scenes that she’s in are great, but she really isn’t in the film all that much. Mud is one of the most well written movies I have ever seen, and anyone can feel free to disagree with me. It’s a deeply layered story of growing up and learning the truth from the adults around you, who are both liars and honest. I’ve seen comparisons to the works of Stephen King and Mark Twain, and I almost see this as a combination of their works. The only thing that doesn’t work is a tacked on ending that I don’t want to really get into. The bottom line is that Mud is a must see for the acting, the story, and the layers of the screenplay. It’s happened. It’s finally happened… All those years of watching movies of different genres, spirits, moods, and messages, and it’s finally happened. My brain should now be legally defined as mush. 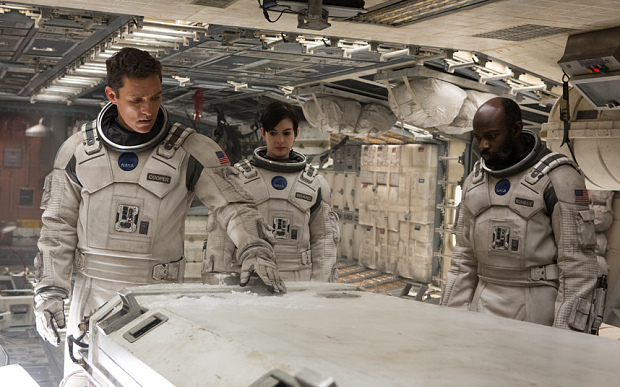 Christopher Nolan’s newest film, Interstellar is the new way to look at science fiction. There has been a series lack of space exploration movies that doesn’t have the Star Trek label. Really only Europa Report and Prometheus come to mind, but now we have Interstellar to add to the top of the list of science fiction. In the near future, Earth’s resources have been slowly disappearing leaving a barely surviving agrarian society. Cooper (Matthew McConaughey) is a former NASA pilot turned farmer who is recruited by Dr. Brand (Michael Caine) to travel through a wormhole found by Saturn. This wormhole leads to another galaxy where other scientists have begin studying different planets orbiting a black hole. Cooper is joined by three other scientists, including Brand’s daughter, Amelia (Anne Hathaway). The mission starts to experience some major problems, while the situation on Earth gets even more complicated when Brand reveals his plan isn’t as promising as he originally described it to be leaving Cooper’s daughter Murph (Jessica Chastain) to keep society from mass panic. This is probably one of the best science fiction movies of the past decade, and may very well be the best science fiction movie of the past decade. 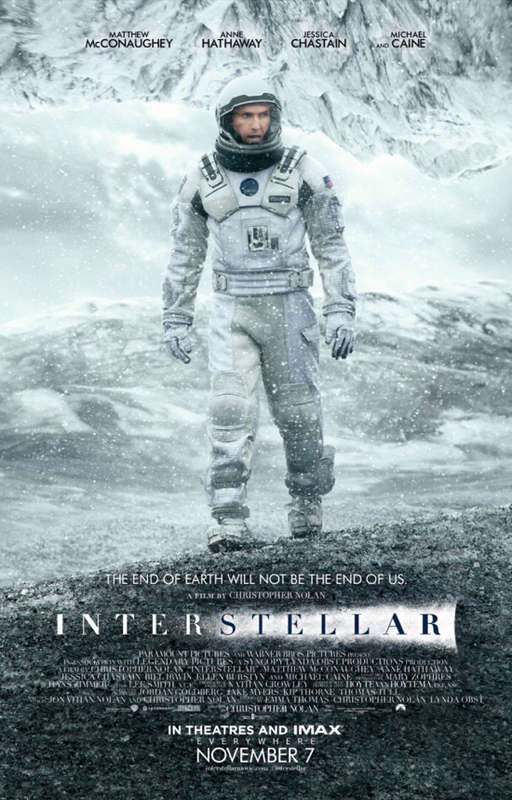 I always figured Inception to be Nolan’s masterpiece, but Interstellar changes things. There are scenes in this movie that are absolutely mind blowing. It’s like Nolan took Stanley Kubrick’s 2001: A Space Odyssey, Andrei Tarkovsky’s Solaris, and Doctor Who and just mushed it all together into one giant mosh pit of sci fi. It’s both quiet and majestic, while being equally intense and explosive. It’s hard to take your eyes off of it, even for a second. I’m a stickler for run times as I’ve made it quite clear so I was concerned when I saw Interstellar has close to a 3 hour run time. I don’t mind if a movie is long, but if it is, I don’t want that time to be wasted on scenes that really have no place in the finished movie. This isn’t a problem for this movie, and it’s equally impressive that Christopher and Jonathan Nolan were able to write a movie that’s this long and make it interesting the entire way through. The film starts off slow with a lot of physics talk and theories, but it all pays off when you see the physics in action when the astronauts blast off. The characters are also all really strong so spending a long amount of time with them is as dramatic and exciting as it can possibly be. Finally, what would a review of this movie be without talking about the incredible effects and sound? Like Gravity, Nolan chose to make space totally silent in Interstellar, which is a great choice especially when something catastrophic is happening. There’s also a lot of great music by Hans Zimmer in the movie that can either make space beautiful or the situation of the astronauts deadly. One scene in particular when Cooper is trying to spin a ship to match the rotation of another part of the ship to dock had all three working in unison. The effects were dizzying and the silence of space mixed with Zimmer’s music made for the best part of the entire movie. Prepare to be blown backwards and thrown all over the place by Interstellar, a movie that is sure to be recognized at this year’s Academy awards. It was a nice reminder, along with Birdman, that all of the excellent movies are going to be coming out. This one took science fiction and took it to a whole new level, along with philosophy. The same was done with the aforementioned 2001 and Solaris, and now Nolan’s true masterpiece continues the tradition. This was a mind boggling science fiction film of truly epic proportions. I would assume that when people think of the film maker Lee Daniels, there are a few movies that immediately pop into their heads. These movies are Precious and the more recent The Butler, a movie which Daniels seemed to love putting his name all over. I would venture to guess that not many people would think of his mainly under the radar film of 2012, The Paperboy, a film based off of novelist Pete Dexter’s book of the same name. While being nominated for Golden Globe and also competing for the Palme d’Or at the Cannes Film Festival, this film remained relatively unheard of, which kind of seems to make sense after watching it. In the small bayou town of Lately, Florida, investigative journalist Ward Jansen (Matthew McConaughey) and his partner Yardley Acheman (David Oyelowo) are hired by Charlotte Bless (Nicole Kidman) for a rather strange job. The two are to investigate an old crime and hopefully prove the innocence of Hillary Van Wetter (John Cusack), a death row inmate who has been charged with murdering a sheriff and with whom Charlotte has fallen madly in love with. Soon, Ward’s younger brother Jack (Zac Efron) makes himself part of the investigation, but can’t seem to get past his feelings towards Charlotte, who is becoming more and more obsessed with Hillary. The investigation is met with a seemingly endless run of obstacles including racism, unexpected violence, and secrets that none of the characters are willing to have come to light. Now, I’ve never seen a movie by Lee Daniels before, but just judging from The Paperboy, I love his style. This movie takes place in the deep south during the 1960s, so there’s plenty of stylistic choices to go with. One way would be to make a film that simply and realistically depicts what this would look and sound like. The other way, or should I say the more interesting way, would be to create a hyper-realistic film shot on 16mm to give it a gritty look, make all of the colors faded, and have all of the actors look like their dying from heat stroke. That is how Lee Daniels makes this movie look excellent. It actually looks like it was produced in the 1960s, so I have to give Daniels a lot of credit there. Not only that, but I could almost feel the heat and humidity that seemed to be radiating from this movie. I also have to give Lee Daniels and Pete Dexter credit on the uncompromising way they tell the story. I was actually kind of surprised that the MPAA let this movie fly so easily cut the way it is. Lets just say The Paperboy went places with its story that I was neither expecting it to, but also it went places that it probably shouldn’t have. I like that the film makers liked to take risks, since not taking them can sometimes lead to a boring movie. The problem that it poses here is that the movie got way too distracted and often times took itself way too seriously. It was too often that the plot strayed way too far from the crux of the drama, and too close to the angsty spirit of Jack. By the time we get to the climax of the movie, I didn’t feel like I was all there cause I wasn’t even quite sure how we got there. It would have been much more interesting to focus on the criminal investigation with these over the top characters, but instead we get a sort of twisted, lustful romance that took itself way too seriously and detracts major, major points from the movie as a whole. What saves the movie from falling too deep into the pit of awful is the performances by each and every one of the actors. Of all the Disney stars that have come out of that hell hole over the past few years, Zac Efron is the one that shows the most potential, and he handles the thickness of this movie well. 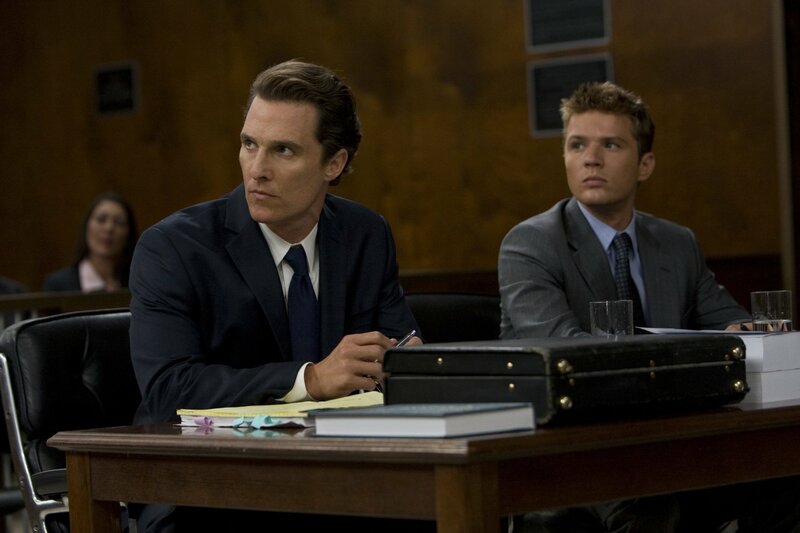 As it would be expected, Matthew McConaughey owns every scene he’s in, even though I feel like he was a tad underused. John Cusack plays a creep almost too well, and I haven’t been as frustrated with a character as I was with Kidman’s in quite a long time. Going back to what I was saying about the story, I just wish they stuck more with McConaughey and Oyelowo’s characters since I found what they were doing much more interesting and involving. I’ve heard a lot of negative things about The Paperboy, but at the same time I’ve heard people who’ve loved it. This is one of those movies where you really love it or you hate it, but for me it just isn’t that simple. I didn’t think that this was a great movie, but it was a good homage to pulpy, entertaining trash. I’m not sure if this is what was expected, but that’s just the feeling I got from it. This would have been a really good movie if the story was more concerned with the drama that actually felt important and interesting. Instead, it gets distracted with some random scenes of steamy lust and young adult angst. Just know what you’re getting into if you decide to watch this movie.